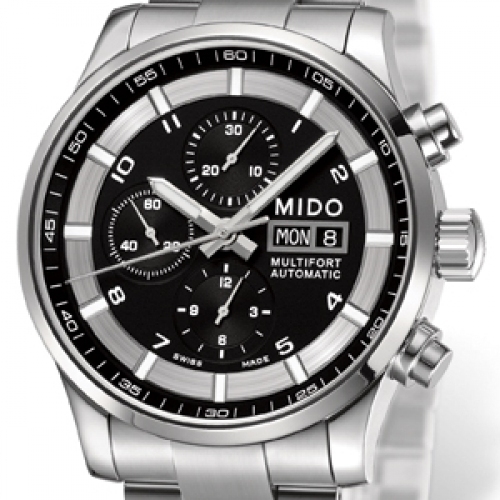 Riveted steel and aerodynamic lines reminiscent of 1930s industrial design: the new Multifort by Mido clearly displays its origins. Equipped with a Valjoux 7750 based movement, this decidedly technical chronograph also boldly asserts uncompromising aesthetic choices through its 44 mm case, black dial adorned with finely satin-brushed platelets, hands and hourmarkers enhanced with white Superluminova, transparent back and stainless steel bracelet. This new benchmark in terms of rigorous reliability exudes a sporting and sophisticated aura that is bound to appeal to devotees of Swiss fine watchmaking.